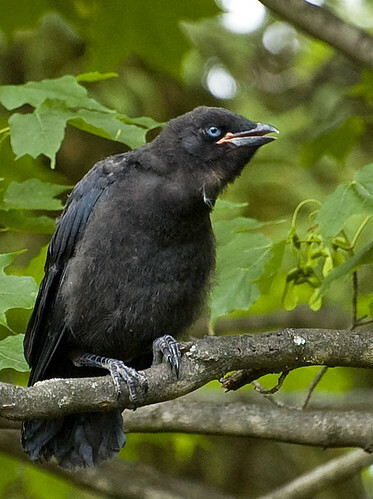 For the last couple of weeks the neighborhood bird ‘song’ has been dominated by the begging calls of two fledgling crows. As loud as they have been, I must admit it has been fun watching them as they have gained confidence and skill in flying. At first they were rather uncoordinated and a bit ungainly as they awkwardly hopped around the branches of the maple tree out back. It seemed like they really wanted to take flight but couldn’t quite get up the nerve. The young were fairly approachable, but if an adult was with them it immediately took off if we ventured too close. 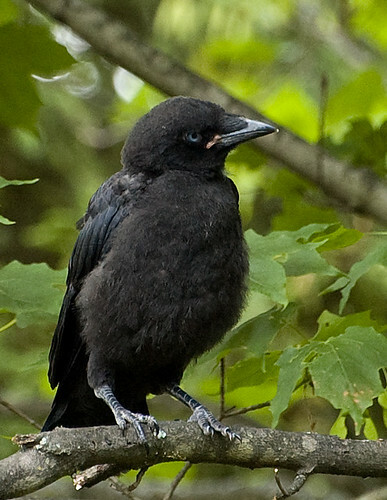 Some of the physical differences noted in the fledglings versus the adult crows are blue eyes, some reddish-orange around the mouth, fluffier feathers, and a duller sheen on their wing and back feathers. 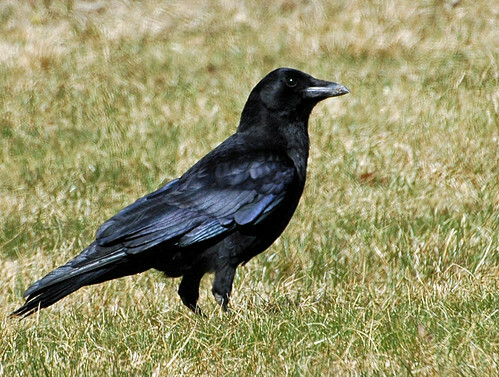 One day an adult landed on the ground with food and one of the young flew down to meet it. The other fledgling begged all the louder until finally the parent flew up for in-branch delivery. The family is still a vocal part of the neighborhood, but things should quiet down in the next week or so as the young become more able to find food on their own (like garbage day this Friday!). This entry was posted on 29 June 2011 by patacoate. 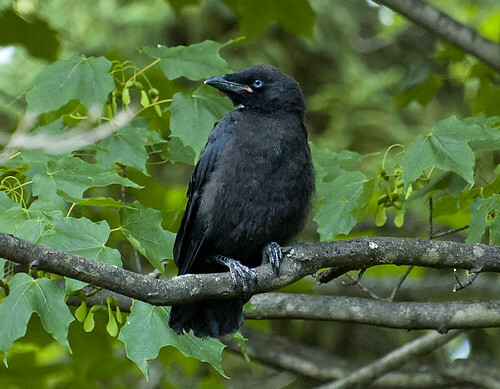 It was filed under iPhone and was tagged with American Crow, American Crow fledglings.